For many of us who love to stare at the idiot box, cable subscription fees are a fact of life. Now I’m not saying that people are becoming idiots because they stare at the screen too long, but it is surprising that many people don’t realize that HD capability isn’t just for cable TV viewing. Nowadays, a lot of local stations provide their broadcasts in stunning high-def resolution, and they even provide the audio in 5.1 surround sound. So if you’re like most people who mostly watch “free TV” shows anyway, you don’t have to rely on cable TV to get clear signals. You just need a better antenna than the rabbit ears of yore, and that’s what you get with an HDTV Indoor Digital Flat Antenna such as the Winegard Company FL-5000 FlatWave. The Winegard Company FL-5000 FlatWave is really paper-thin, and it has adhesives that act like Velcro so that you can just plaster it on a window. It doesn’t take all that much space. Now Winegard may recommend that you put it flat on the TV cabinet, or perhaps place it on the wall behind your TV, but those really aren’t the best places to put them. The top of the window where it can catch the TV signals is your best option. The setup is also very simple. Once you know where to put it, connect the coax cable coming from the HDTV Indoor Digital Flat Antenna to the TV’s Antenna In coax port. Now run a channel scan, and then get some popcorn and soda. You can also count your savings, since you can save a lot of money with this equipment. No subscription fees, no long-term contract, no credit checks, no cancellation fees, and no installation fees. And even if you do have a cable subscription, it may be a good insurance policy to get the Winegard Company FL-5000 FlatWave, just in case. You don’t want to be at the mercy of the capriciousness of your cable company. So if your cable service suddenly decides to go bonkers when you’re watching something truly important to the course of human history, (such as Sunday Night Football for guys and the Oscars for the ladies), you won’t go crazy trying to get your signal back. Once you learn that it’s best to put the HDTV Indoor Digital Flat Antenna near the window (it’s still an antenna, after all), then you’ll enjoy lots of high definition programs on your TV. And that’s only by paying a measly $35 for the antenna, because there are no monthly subscription fees involved. This “thing” may not look all that great (especially with a white wall background), but you didn’t buy it to stare at it—you bought it so that you can watch expensive TV shows on your expensive TV for free! 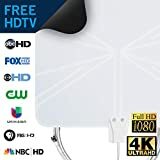 Grab the Winegard FL-5000 FlatWave HD Flat Antenna from Amazon NOW!